Apple’s Photo Stream aims to make it easier to share pictures between your various Apple devices, but using the feature on your Mac can be annoying: Doing so requires you to fire up iPhoto or Aperture just to see your pictures, and waiting for the hulks that those programs have become, just to see the photos you took on your iPhone, is overkill. 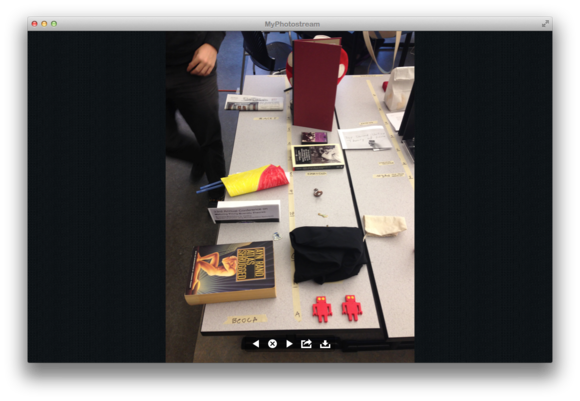 To simplify the process, Raffael Hannemann created the $4 MyPhotostream, a lightweight app that does just one thing: displays the pictures in your Photo Stream. Specifically, each time you launch the app, it checks your Photo Stream and shows a grid of thumbnails for those photos. MyPhotostream presents all your images in a grid, but the only view option is a choice between small, medium, or large thumbnails. The only viewing option you have is to choose if those thumbnails are small, medium, or large. Personally, I’d prefer a slider for size, like the one found in many other photo-viewing apps. MyPhotostream also loads only around 40 images at a time—to see more, you must click a plus-sign (+) button at the end of the list, which can get annoying if a photo you want to view is a month or two old. Additional options for sorting, or grouping by month, would go a long way toward making the interface more friendly. To see a larger version of an image, you just double-click it. When viewing a single photo, arrow buttons let you jump to the next or previous photo in your Photo Stream; other buttons let you close the image, access sharing options, or save the image to your drive. MyPhotostream also supports Quick Look previews, which you can trigger by selecting an image and then pressing Spacebar. Oddly, you can use the arrow keys on your keyboard to skip between images only when using the Quick Look preview. Viewing a single photo lets you choose from a variety of sharing options, including saving the image to your drive. 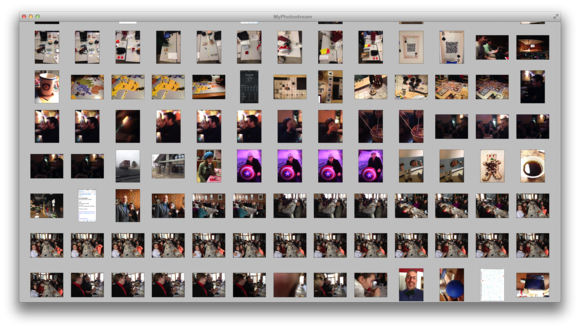 If you want to work with an image from your Photo Stream, MyPhotostream provides a few options. Control-clicking any image presents a variety of options, ranging from saving the image to your Downloads folder; to sending it via email, Messages, or AirDrop; to sharing it on Twitter, Facebook, or Flickr—any social media account configured in OS X’s Internet Accounts pane. You also get a list of apps that can handle the particular image type—select one of these apps to open the image in that app. Dragging an image thumbnail to the Finder copies the full photo to that location. As new pictures are added to your Photo Stream, MyPhotostream sends you notifications. As new photos are added to your Photo Stream, MyPhotostream alerts you with a banner in Notification Center. Sometimes there’s a considerable delay between, say, taking a picture on your iPhone and having it show up on your Mac, but in my experience that’s an issue with how Photo Stream works (or your network connection) rather than with MyPhotostream. A couple things to keep in mind with MyPhotostream: The app can show only the most recent 1000 photos in your stream, and since it’s merely accessing where the stream is stored on your Mac (in a folder in ~/Library/Application Support/iLifeAssetManagement that you shouldn’t touch), it’s not doing any additional archiving—for that you’ll still need iPhoto or Aperture. In fact, you’ll need iPhoto or Aperture either way, as MyPhotostream requires that you have one of those apps installed and that you’ve configured Photo Stream in that app or in System Preferences. After doing so, however, you can use MyPhotostream without having to touch Apple’s own apps. While having those capabilities would make MyPhotostream even more useful, more features of course means more complexity. The utility and joy of MyPhotostream as it stands is that it’s simpler than the alternatives—and for that, it’s a welcome addition to your Mac’s Applications folder. Update: Not long after this review was published, MyPhotostream was update to version 1.0.4, which adds some new features, including the ability to load a larger batch of pictures at startup, and gesture-based navigation. These chanoes improve the app, but they don't affect our rating. MyPhotostream is an easy way to view all the pictures in your personal Photo Stream without having to launch iPhoto or Aperture.